Despite the fact that it is still cold here in Blighty, there is a definite mood that Spring is on its way. That must mean it is time to end all thoughts of tweeds, wool and heavy knits and time to start planning our spring wardrobes. 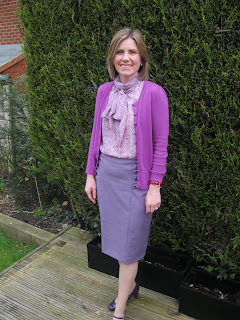 Inspired by the Sew Weekly challenges of "Pretty as a Picture" and using the "Pantone Spring Colours", here is my first spring outfit. The Top is Vogue 1127. 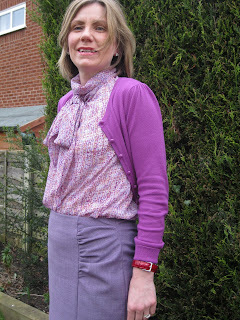 There are loads of reviews of this top on Pattern Review, all commenting about how big this top runs. In particular, I used the alterations that Amanda S made to reduce the width and length of the ties and the width of the collar. I sewed a Size 6 instead of a Size 8 but I wish I had left the armholes a size 8 as it is a little bit snug there. I decided this was far better than a gaping armhole though and left it. Just one question..... to Spanx or not to Spanx? A year on from giving birth, I am pretty much back to my former RTW Size 10, apart from what can only be described as a flap of stomach around by belly button ( sorry if this is too much information). Looking at these photos I realise that it might be time to investigate foundation garments! Where I live, it is way too hot for Spanx. It never seems that comfortable to me.